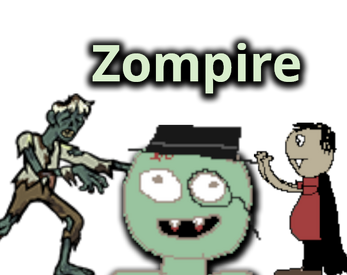 Zompire is a hybrid of a zombie survival and diplomatic strategy game. It's also a hybrid of playing for both the good guys and the bad guys at the same time. 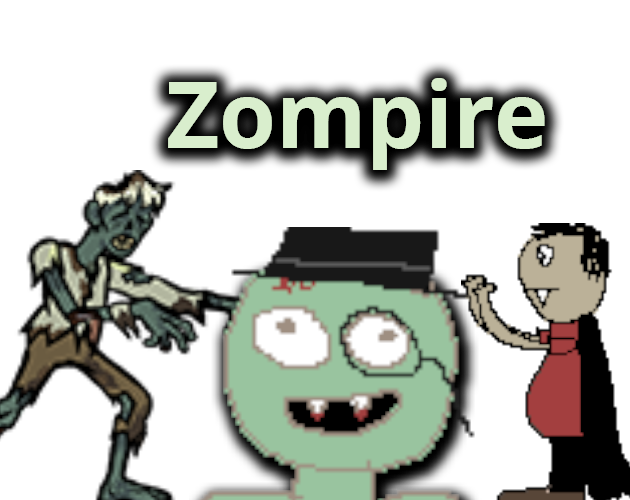 You play as Zompire Vambie, the mayor of a town of vampires! Keep your townspeople happy by lying to them about the threat of the zombie apocalypse, then go out and kill those zombies! You must balance fighting the zombies with managing the town in real time. But wait, you're also the mayor of the nearby zombie town. Keep that town happy as well while killing the invading vampires. Oh, but killing vampires will make the vampire town angry. And killing the zombies will make the zombie town angry. And angry towns will send tougher enemies to battle. And why are you playing for both the good guys and the bad guys anyway? And why are you pleading for peace while provoking war?